With any Mountain Howitzer cannon, one must also have the necessary Tools and Accessories. Some of the following items were fabricated while building the Mountain Howitzer carriage and barrel. Some were made later. 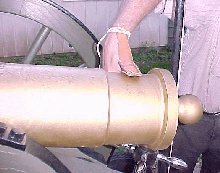 To close off the front of the Mountain Howitzer cannon barrel when not in use, a device called a "tompion" was made. ( Tompion is French for "hole plug".) This muzzle plug was used to keep out rain, dirt, and small animals, between firings. 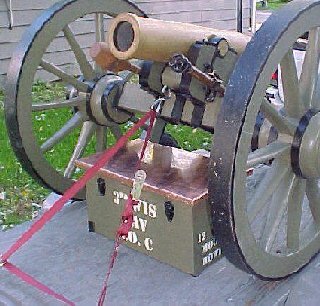 During the Civil War, most howitzer cannons were kept loaded, for emergencies, and could be even be fired with the tompion left in place. 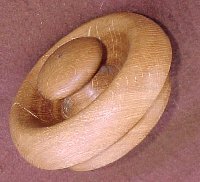 Tompions were constructed of various woods. This one is made of white oak. A recessed area, just under the rim of the cap, is filled with coils of waxed string or leather to provide a water tight seal. 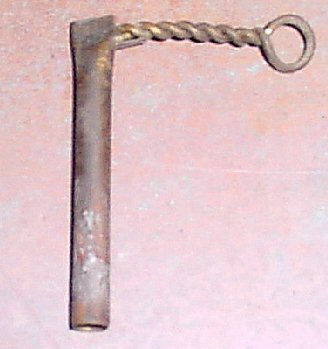 A "Worm" was fabricated for removing any remnants of the powder bag from a previous firing. In use, it is inserted into the bore, pushed down into the chamber, and rotated. The twisting action of the corkscrew end snags any remnants which are then withdrawn. A 2-1/2" diameter Sponge is attached to the opposite end of the Worm for "wet sponging" the powder chamber prior to loading. Wet sponging was required to extinguish any remaining burning embers from a previous firing. For obvious reasons, inserting a powder charge on top of smoldering embers is extremely dangerous. A Rammer was fabricated for loading the powder charge. The head of the Rammer is sized to fit the bore and tapered to correspond to the shape of the powder chamber. A second, larger diameter Sponge was attached to the opposite end of the Rammer. This 4-5/8" diameter sponge matched the diameter of the Bore and is used dry. The "dry sponging" removed any excess water from the previous "wet sponging" operation. The Folding Handspike was made from a purchased hickory shovel handle that was shortened and tapered to fit into the handspike socket. 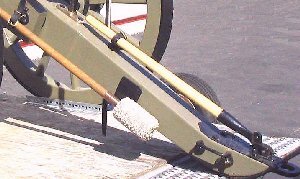 The handspike is used to "aim" the Mountain Howitzer. 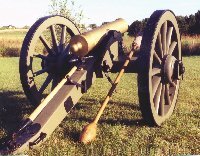 It is un-strapped, folded back, and used for leverage to push the end of the trail, left or right, as directed by the Gunner. 5 leather straps were used for securing the 2 loading implements and the folding handspike to the carriage. 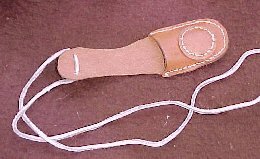 The straps were simply "Ames straps" for an Ames horse harness, that were purchased complete with brass buckles from a local Amish harness maker for $5 each. 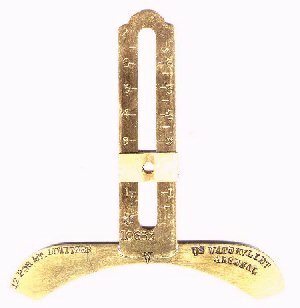 They were shortened and attached with large metal staples per the original method of 1850. 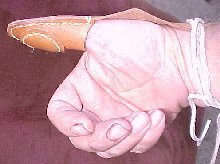 This finger glove device is called a "Thumb Stall". It is easily made or, inexpensive to purchase. It was used during the barrel cleaning operation to prevent any air from entering the barrel through the fuse hole. Air entering could "fan-the-flames" of a smoldering ember. During the entire barrel cleaning operation, "worming", "sponging", etc, the fuse hole is kept blocked. The padded leather construction provided an air tight seal and kept the users thumb from being burned. This item is called a "Gunner's Quadrant". 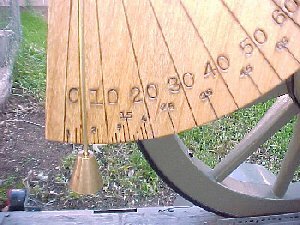 It was fabricated from white oak and is little more than the combination of a protractor and a plum-bob attached to a stick. Great care was taken in laying it out to keep all surfaces square and true. 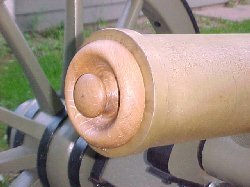 The Gunner's Quadrant is placed in the barrel of the mountain howitzer as shown, and then the barrel is raised or lowered with the elevating screw to give the desired elevation of the gun. ( Elevation was read along the wire.) This device was later replace by the "Breech Sight", which was also made. These tools are: "Vent Brush", "Vent Punch" and the "Powder Prick". The Vent Brush is used to brush and clean the fuse hole ( vent ) between firings. The Vent Punch has a flat face and is used to "punch" out any stubborn blockage of the fuse hole if brushing is hampered. The powder Prick has a pointed end and is used to poke a hole into the powder charge bag just prior to priming the gun with fuse or friction primer. This tool is called a Lanyard. 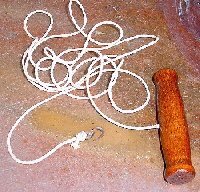 It has a 10 foot cord with a brass "hook" attached to one end, and a wooden handle on the other. 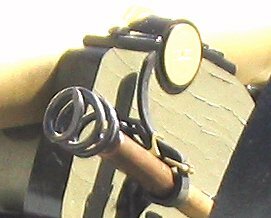 The brass hook attaches to the wire loop on the " friction primer". 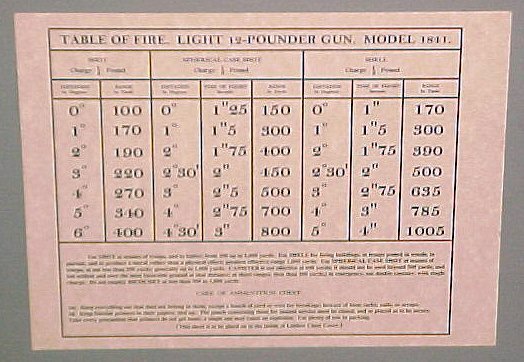 The friction primer is an ignition device consisting of a small copper tube that contains powdered chemicals similar to those found on the striking end of a farmer's match. It also contains a small charge of very fine black powder. 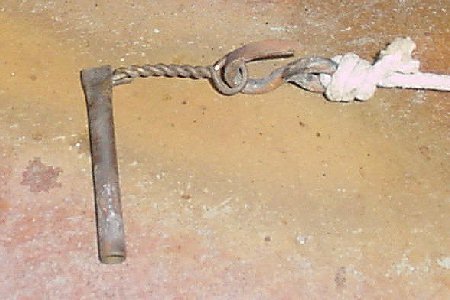 One end of a coarse wire extends down into the friction compound while the other end has a twisted exposed loop for attaching a Lanyard. 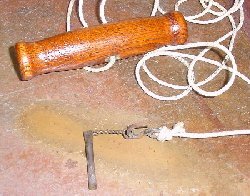 When the Lanyard is pulled, the wire is "jerked" out of the friction compound which ignites the black powder. The burning black powder shoots a flame down into the Mountain Howitzer's chamber which instantaneously ignites the main charge. This device is a "Breech Site". It is calibrated in degrees of elevation for the particular gun for which it is designed, in this case, the 12 pound Mountain Howitzer. 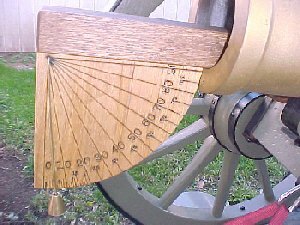 First, you slide the indicator to the desired elevation and hold the site over the vent hole at the breech of the gun. Then, you adjusting the elevation of the gun by turning the elevating screw while looking through the site, and aiming over the front muzzle rim of the barrel. When all is aligned, the gun is sighted at the desired elevation. 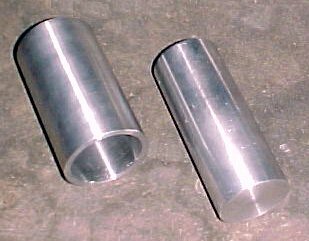 These aluminum tools are the "Mandrel" and the "Sleeve" that are used for making the powder charge. ( See next page ) The Mandrel is sized 1/16" diameter smaller than the powder chamber of the Howitzer barrel, and the "Sleeve" is sized to a "slide-fit" over the mandrel when it is wrapped with 2-1/2 layers of the Heavy Duty aluminum foil. 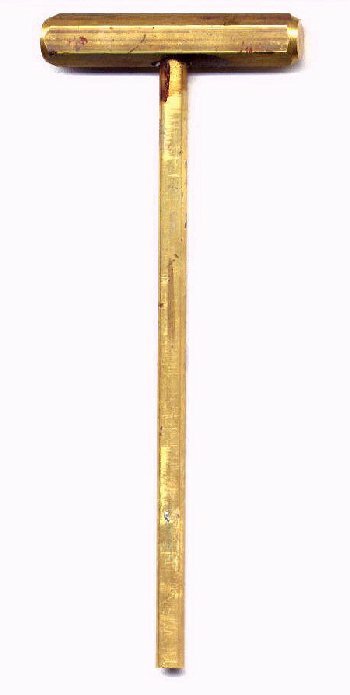 The Mandrel was made 8" long with one end slightly rounded. 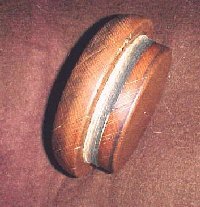 It also has a 1/16" wide "V" groove machined its full length to allow trapped air to escape when forming the powder cup. The sleeve is 2" shorter than the Mandrel. Finally, we built an Ammunition Chest to store all our load making equipment and tools. I didn't want to duplicate an original limber chest, but rather, decided to build an ammo chest that simulated "some" of the design characteristics and construction methods of the period. That way it would look similar to an original limber chest, but it would be more suited to my needs. The Ammo chest was made of wood and painted the same olive drab green to match the mountain howitzer carriage. The metal parts were painted black to match as well. 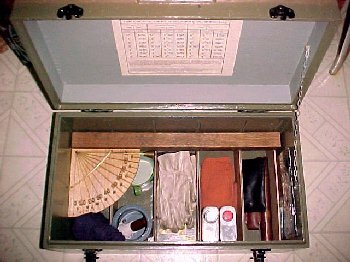 It was made with the typical copper covered top of a limber chest that hinged open. Small carrying handles were used rather than the larger side handles that were common on limber chests. 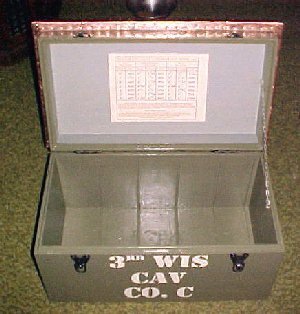 ( Large handles on original Limber chests served for the soldiers to grasp while the rode on the limber, seated on the chest.) 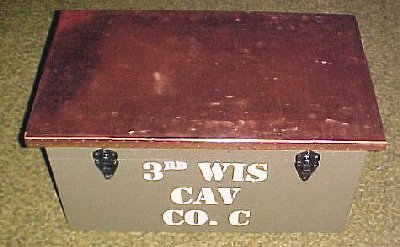 The completed chest was stenciled with the appropriate markings of the 3rd Wisconsin Cavalry, Company C.
The "Loading Table" was glued inside he cover. A close-up of the loading table for the Mountain Howitzer shows information on elevation / range settings, and range / time setting for cutting the time delay fuses. Artillery soldiers were much better educated than most other Civil War soldiers. Unlike soldiers in the Infantry or the Cavalry, Artillerymen had to know how to read. 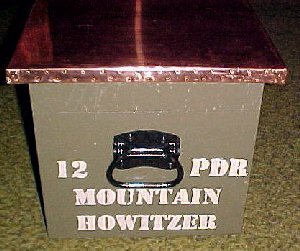 A view of the end and the back of the mountain howitzer Ammo Chest. 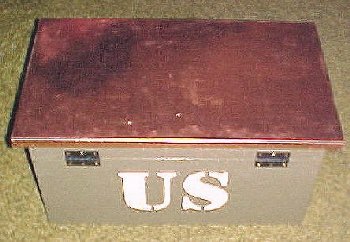 A close-up view of the ammo chest lid using original fabrication methods of the 1850's. 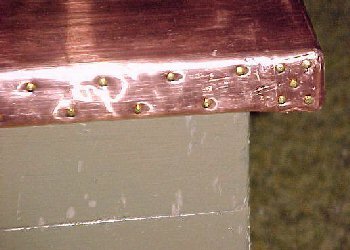 Over 300 copper nails were used to attach the copper cladding to the wood. The copper ensured no "static sparks" would reach the ammunition stored inside the chest. A view of the inside of the fully loaded ammo chest. Partitions inside keep everything in its place. Although the powder is stored inside with the rest of the tools, friction primers and other ignition devices are never stored in the chest with the powder. Everything fits neatly in place when towing the Mountain Howitzer. 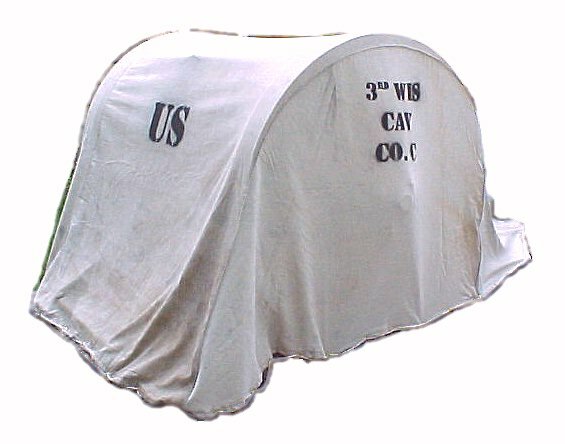 For storing the cannon we made a custom fit cover from an old canvas tent. First, we rough-cut the pieces, and then stapled them together with an ordinary hand held office stapler. The pieces were sewn together following along the stapled seams. After sewing, the staples were removed. Eyelets were added around the bottom edge, and a cord was threaded through the eyelets. Stenciling added the final touch.